Summer. That time of the year when Minnesota's two best attributes collide - the great outdoors, and theater. 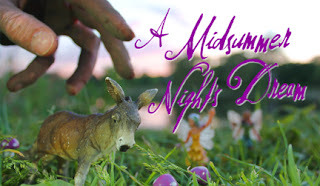 And what better play to experience on a beautiful Minnesota midsummer night than Shakespeare's most beloved romantic comedy A Midsummer Night's Dream? For their annual free summer Shakespeare in the park, Classical Actors Ensemble has made this perfectly obvious choice and delivered a charming and playful rendition of this tale of fairies and fools in love. 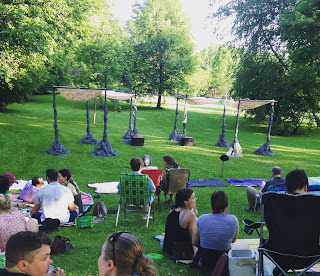 They perform every weekend through mid-July either at Lake of the Isles or various Metro area parks (I caught up with them in Como Park), so be sure to add this to your summer to-do list (see my full summer theater must-see list here). This is how Shakespeare was meant to be seen - playful, immediate, approachable, and accessible to all. Director Michael Kelley and his team have trimmed Midsummer down to a just over two-hour run time with no intermission. I've seen the play several times, but I couldn't tell you what was cut out. Everything is still there, from the four young lovers chasing each other through the woods (Helena loves Demetrius, Demetrius loves and is betrothed to Hermia, Hermia loves Lysander, Lysander used to love Hermia but now loves Helena due to a spell place on him by the mischievous Puck), the group of actors rehearsing for a play before the Duke, said Duke and his court, and the fairies frolicking in the woods in service of their Queen Titania and King Oberon. The play itself is very earthy and nature-based, and is therefore perfectly suited to be performed in and among nature herself, with the elements of chirping birds, shining sun, and blowing breeze only adding to the experience. Performed on a hillside just south of the Como Park Pavilion, little set is needed in addition to the one nature provides. They make great use of this space, particularly with cast running through the field behind the stage until they're out of sight in the trees behind, expanding the world of the play past the stage, past what we can see, until you feel like you're really in this world. The few set pieces there are consist of a series of poles wrapped in gray gauzy fabric, draped with peach floral fabric, creating the perfect fairy playground. The cast is clad in loose and comfortable fairy garb that allows them to run around, with elegant touches for royalty (scenic design by Justin Hooper, costume design by Meredith Wagner). And run around they do. Everyone in the 20-person ensemble is playful and present, often entering and exiting through the audience sitting on blankets and camp chairs on the hillside. Timothy Daly is our Puck, narrator and chief mischief-maker, becoming more and more dirty throughout the show until he's almost entirely covered in mud! Neal Beckman (who recently played Puck in Walking Shadow's follow-up to Midsummer, A Midwinter Night's Revel) and Megan Volkman Wilson are fun to watch as Theseus/Oberon and Hippolyta/Titania, both individually and as these two love/hate pairs. Also notable in this solid cast are Marika Proctor, Andy Schnabel, Justin Hooper, and Hannah Steblay as the four young lovers, charming and funny and passionate all. A Midsummer Night's Dream continues through July 17 at a park near you. Check their website for the full schedule with detailed location of where within each park they'll be performing. It's free and no reservations are required - just show up! Bring a blanket or a lawn chair, bring your dog or your baby, bring a picnic, bring sunscreen, and enjoy a classic Shakespeare comedy in the way it was meant to be enjoyed - playful, earthy, accessible, immediate, and fun.